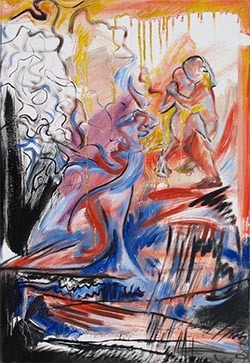 In her work Anya emphasizes the connection between various forms of art in her work: Dance, Music, graphic arts. She works side-by-side with the musicians: Together with several musicians she had created a program “Sounds on Canvases” which was presented at the University of Kansas, and then the Kiev, Ukrain, Cultural Centers. The program is a combination of Music and Art Presentation in a concert setting. 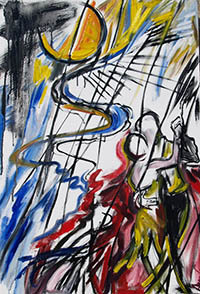 The highlight of the program is when the painting is created on-stage, while the music is being performed. In her past work Anya had concentrated on "creating" visual pieces for the music of the Argentinian tango-jazz composer Astro Piazolla, Spanish composer Manuel DeFalla, and the contemporary composer Mikhail Shukh. 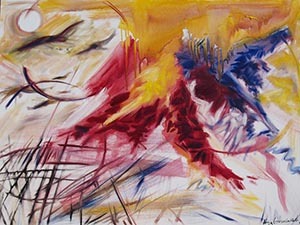 Some of the works are presented on the pages Music & Dance and Abstract. UC graduate student Anya Gerasimchuk has created a synthesis for her love of visual art and music. Anya, a painter, began studying both music and visual art from a young age and graduated from Volga Region Music School after eight years of study. Her current project with contemporary composer and honor artist of Ukraine, Mikhail Skukh, is the manifestation of her visual and musical aspirations. Mikhail, a member of the Russian/ Ukrainian Composer's Society and director of the well-known Christian Orthodox Festival, whose work includes symphonies, masses, cantatas, choir, chamber ensembles, and music for theater and cinema, describes his music as coming from philosophical and religious ideas, giving them a meditative quality. Anya's oil paintings and watercolors are also meditative; the synergy between visual and audio are designed to create a peaceful and contemplative fluidity in the audio-visual experience. The paintings within this body of work are to be exhibited with earphones such that visitor can listen the corresponding composition. Anya believes that combining the study of creative forms in music and art gave her a great tool for understanding how both the visual and audio are unified, stating, "I believe that each piece of visual art can be translated into music and vice versa." Anya and Mikhail will be exhibiting the work in September in Anya's home country of Russia at Saratov State Art Museum and in December 2005 at the Composer's House in the Ukraine. She hopes to eventually bring the exhibition to the US. Web-site publication on the “Music/Visual Art project” of the college of Design, Architecture, Art and Planning web-site, 2004. Based on the above work, Anya had published an article Synesthesia - What Music Can Tell A Painter" in the profesisonal magazine "Problems and Development of the Professional Education at the Times of Social Reforms". Synesthesia - What Music Can Tell A Painter"
Most of us enjoy the simple pleasures of looking at a nice painting or listening to a beautiful melody. Have you ever enjoyed a sight of a sunset and a song of a bird – or a movie scene with your favorite song at the background? The visual and auditory sensations seem very natural and delightful. Even from the times of ancient people when chanting or dancing were combined with painting geometric forms or bright colors on the bodies or walls of the sanctuaries, we see the natural tendency of humans to combine auditory and visual.